Passaic, N.J. August 26, 2011 - Contempo Closet hits the streets of New York City with five of their specialty wardrobe closets on wheels. The wardrobes have been retro-fitted with wheels and are being pulled through Manhattan’s streets; lending themselves to the name “walking wardrobes.” This new initiative is a way to bring the product to the customer in a new and innovative way. “When making a big purchase, like furniture, consumers should have the opportunity to see and interact with the product,” says Gary Flax, a Contempo design consultant. Interacting with the product means a variety of things; for some, seeing is enough while for others, a more sensory experience is needed. “In this case, we are being proactive and taking the product to the customer.” Due to the increased accessibility of the Internet, manufacturers need to take new and creative steps to engage customers in real time. This project is a way to unite the wardrobe closet to the consumer in a way they never have before. In order to find out where the wardrobes will be, follow us on Twitter @ContempoCloset and at Facebook.com/ContempoCloset. In addition, check back shortly for photos and video of the “walking wardrobes” in action and for future appearances. Contempo Closet supplies “The Instant Wardrobe.” Contempo Closet, a furniture company based in New Jersey, specializes in American made custom wardrobe closets for quick and efficient storage solutions. 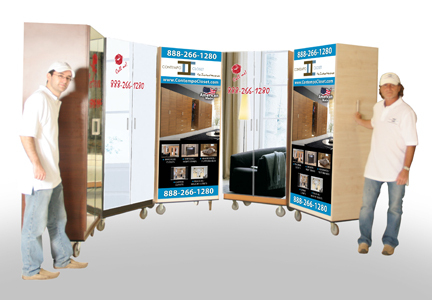 Design consultants and craftsmen work with customers to create freestanding wardrobe closets from modular units that best meet the customer’s storage needs. For more information, or to view the complete line, visit www.contempocloset.com. This entry was posted in Company News and tagged modular unit, NYC, portable wardrobe, the instant wardrobe, walking wardrobe. Bookmark the permalink.